Nissan is working with infrastructure partners to deploy high-power electric vehicle charging points along major European routes, including the UK’s Electric Highway network, ahead of the longer-range Leaf arriving in June. The Leaf e+ was unveiled earlier this month, offering a 55% increase in battery capacity from 40kWh to 62kWh, extending the range to 239 miles under WLTP conditions and bringing it more in line with the Hyundai Kona Electric and Kia e-Niro. To retain the current car’s ability to regain 80% of its range within around half an hour, Nissan has also upgraded the on-board charger to support 70kW charging (100kW peak). Alongside their first EVs, Nissan and Renault partnered with infrastructure companies across Europe to deploy rapid chargers on major routes, compatible with the Leaf’s Chademo connector and Type 2 plug used on the Zoe. In the UK, it has worked with Ecotricity to roll out 300 units at service stations and branches of Ikea, beginning in 2011. However, most of this infrastructure is designed for an output of up to 50kW. Newcomers including the e-Niro, Kona Electric and Jaguar I-Pace, as well as the longer-range Leaf, can all support faster charging. 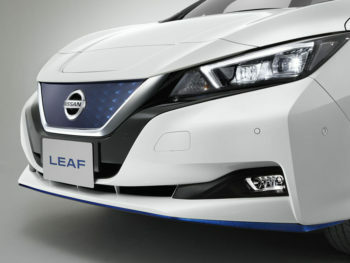 Customers in Europe can already place orders for the Leaf e+, which launches as a limited edition 3.Zero trim. First UK deliveries will take place from June, after Japan and North America, and while initial battery supply is limited, it will become a permanent part of the range alongside the 40kWh battery offered to date. Although Hyundai and Kia expect the shorter-range versions of their electric SUVs to be the smaller sellers, Bedrosian said Nissan’s expected sales mix is very different.